A rural setting near the historic market town of Faversham, enjoy this group accommodation in a truly peaceful setting. Lovely period holiday cottage converted from a traditional Kent Oast house to offer beautiful accommodation in a charming rural setting near to the historic city of Canterbury. 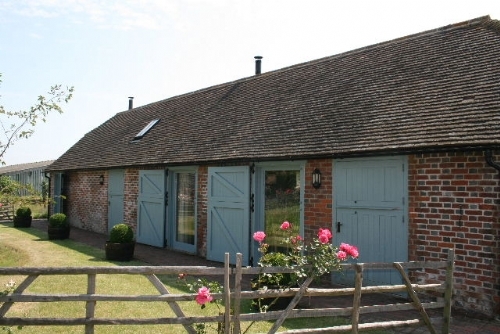 The combination of oast and cottages has the use of a swimming pool and tennis court and for larger parties or group accommodation you can combine Great Higham Barn in the complex to sleep up to 44. Ideally located just an hour and a half from London and close to both historic Faversham and the popular seaside town of Whitstable there is lots to do during your stay! Service rating : Overall service was good but thought some of the email communication wasn't as clear as it could be. also, I would have preferred an enhanced digital service. My one gripe was the online payment system as it did not work for overseas cards. Thank you for taking the time to leave a review. Sorry to hear that you had troubles with the online payment system this has been noted. Also your comments regarding the cutlery and toiletries will be feedback to the owner for consideration. We are pleased to hear that overall you had an enjoyable stay and hope to see you again in the future. Product : Good value midweek break. Product : The property was advertised as having bikes available for hire, none of these were working which meant that half our group were unable to go on the bike rides that others went on. We are very sorry the bikes were not in working order for your stay. We did contact the owner at the time and they have now arranged for full maintenance to be completed. Hopefully this did not stop you from enjoying the rest of your stay. "Most lovely place. Already planning my next stay. Thank you." After a dip in the pool why not head into nearby Faversham for a tour of the famous Shepherd Neame brewery, try some of the local beers and learn all about the brewing process. Great Higham Oast and Cottages: Sleeps 18 in 6 bedrooms, 1 reception room, 2 bathrooms (1 en-suite) and 1 WC. Outside patio with seating for 10, BBQ, outside swimming pool (heated from Eatsre to October half term) and further outside space to the rear. Under cover car parking for two cars. Family bedroom (sleeps 4), 1 double bed and 2 single beds and a wood burning stove.